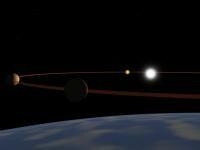 These images were generated to illustrate, or appreciate, various astronomical subjects. 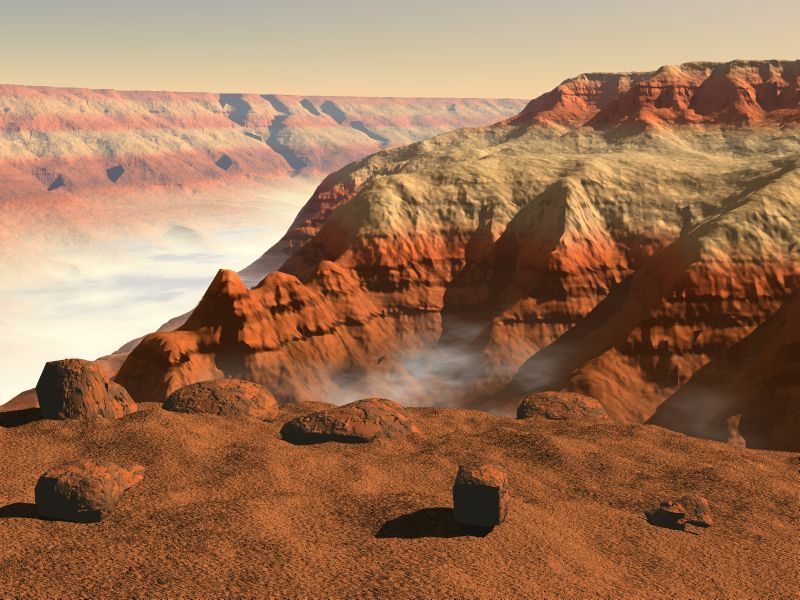 Software included the cheap, powerful, and idiosyncratic Imagine modeling, rendering, and animation program, the VistaPro 3-D landscape rendering program, and the Bryce 2 landscape rendering program, on either an Amiga 3000 or a PC, mostly back in the 1990s. Imagine rendering of the dark side of Saturn's rings, looking back towards the Sun (which was painted in later), shining through the C ring. 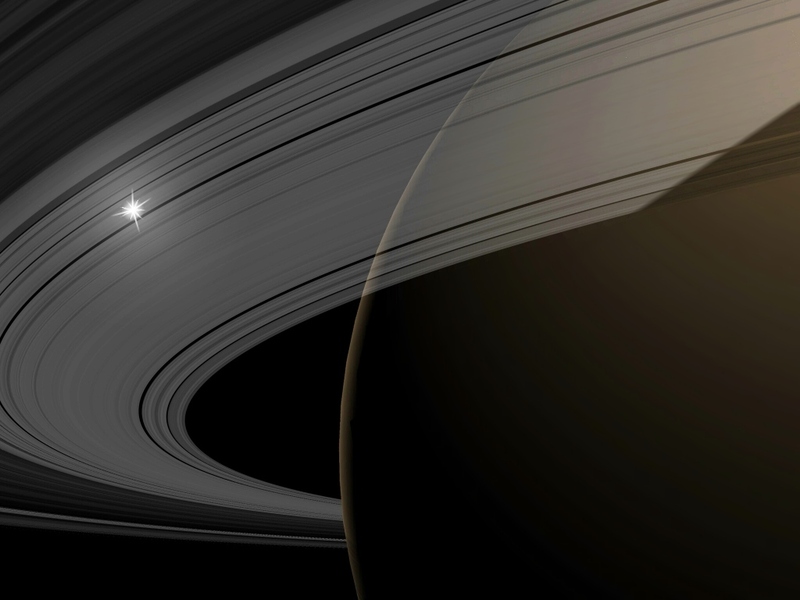 Other post-processing included blurring the planet's shadow on the rings. The ring structure, based on a model by Bjorn Jonsson, is fairly accurate. I also used his Saturn map, but it's not seen to advantage from this perspective! The illumination of Saturn's night side by the rings is represented by a single faint light source- the reality is far more complicated and beautiful, as can be seen in this Voyager 1 image. 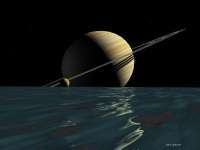 Discussion of how to render Saturn's rings, and copies of the necessary maps. 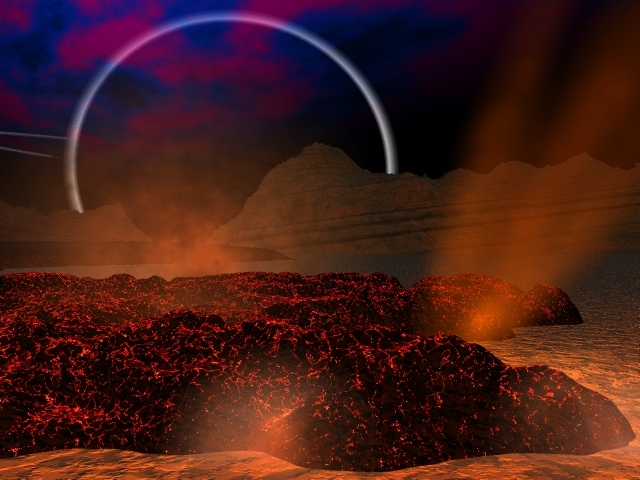 Bryce rendering of a Triton-like alien world, with a thin, hazy, atmosphere. 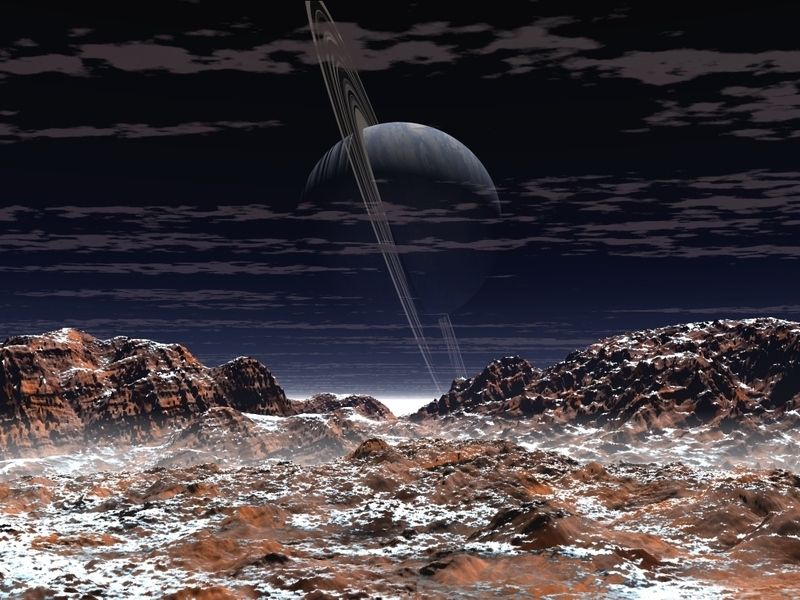 An Imagine-rendered ringed planet hangs in the sky. Created for the Spring 2001 Lowell Observer. This image has been used by the TSG Titans Rohrbach women's soccer team in Germany for their home page. 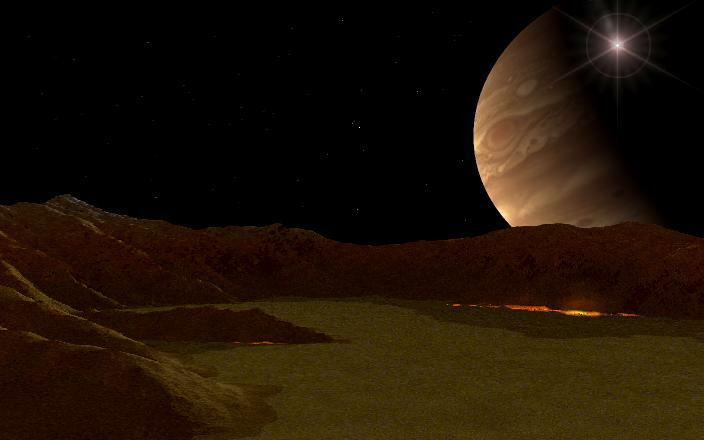 Bryce rendering of an Io scene. A silicate lava flow is vaporizing sulfur dioxide frost as it flows over the surface. 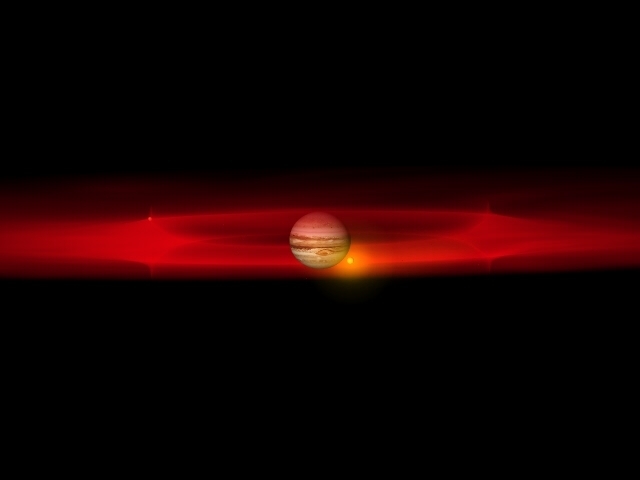 The same scene during a solar eclipse by Jupiter. 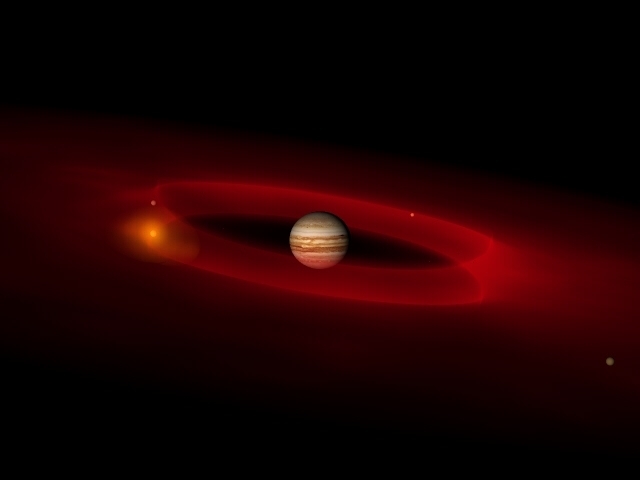 Note the backlit Jovian ring projecting beyond Jupiter's limb, and the auroral glow in the sky. 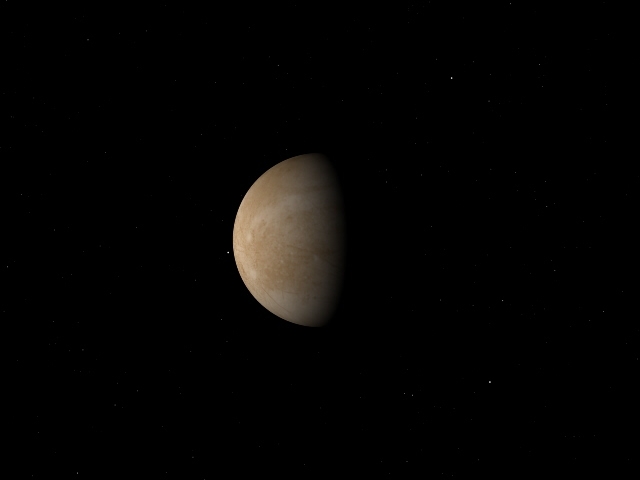 I was unable to render a realistic backlit Jupiter in Bryce, so resorted to using a 2-D bitmap. 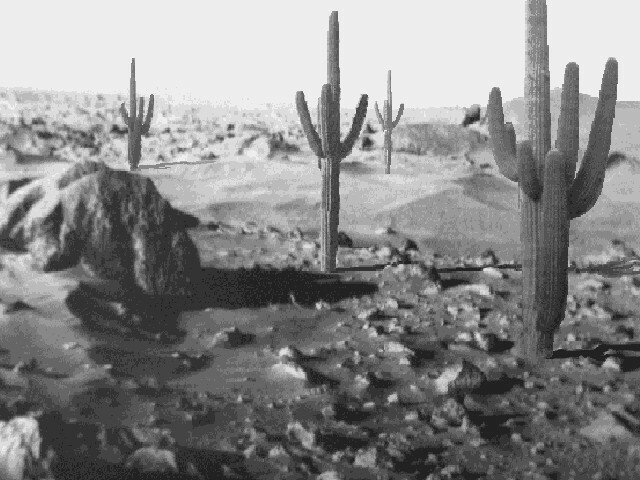 Not sure if this counts as an astronomical visualization... Saguaros on Mars, created for the 4th International Colloquium on Mars, Tucson, January 1989, where it appeared on the abstract book cover and the official conference coffee cup (I still have mine!). Done with Deluxe Paint on my Amiga 500. Crude by today's standards (4-bit greyscale, low resolution, no anti-aliasing, images digitized using a Digisnap frame grabber rather than a scanner), but I was proud of it at the time. Flyby trajectories are imagined and non-Keplerian: the object is to show the body to its best advantage, rather than simulate a real flyby. Click on any frame for a full-sized image. 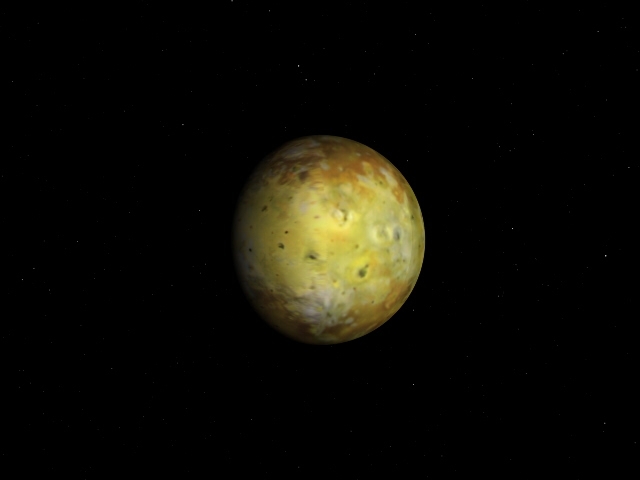 Stills (every 100th frame) from an Io flyby animation. Jupiter visible in the background. 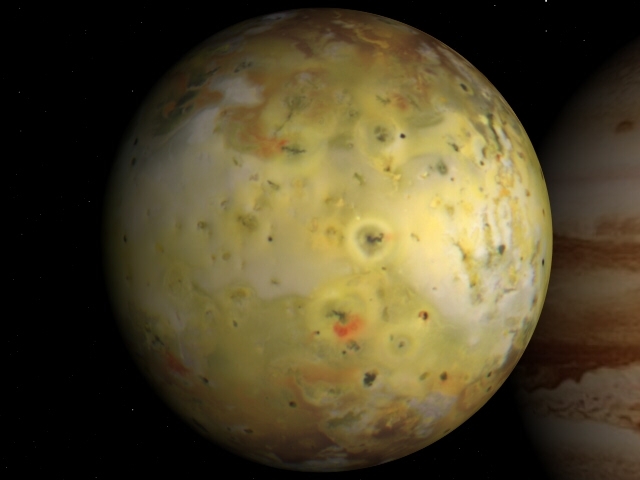 The Io map is by Paul Geissler. 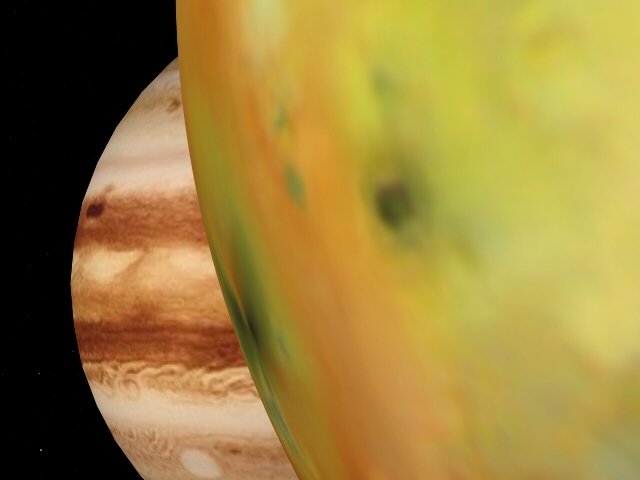 Io is shown in its correct orientation with respect to Jupiter. 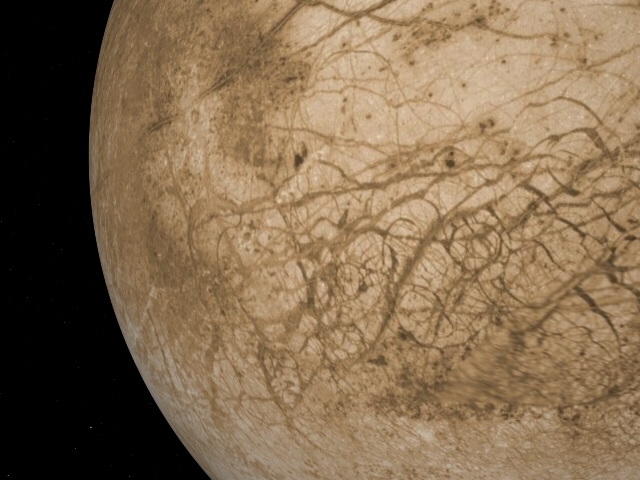 Stills (every c. 100th frame) from a Europa flyby animation. Jupiter and Io visible in the background. 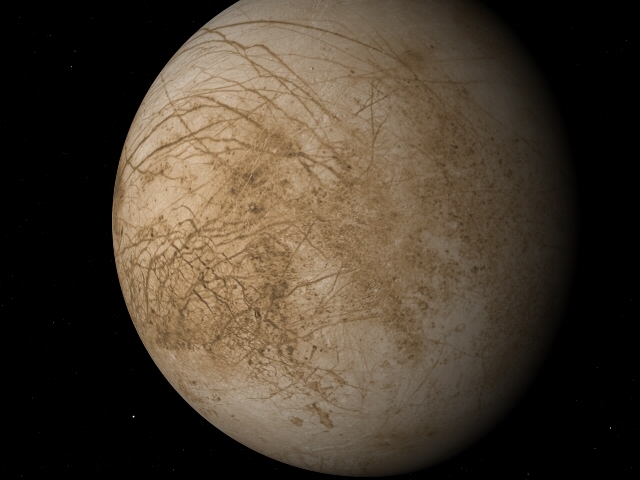 The Europa map is by Bjorn Jonsson. 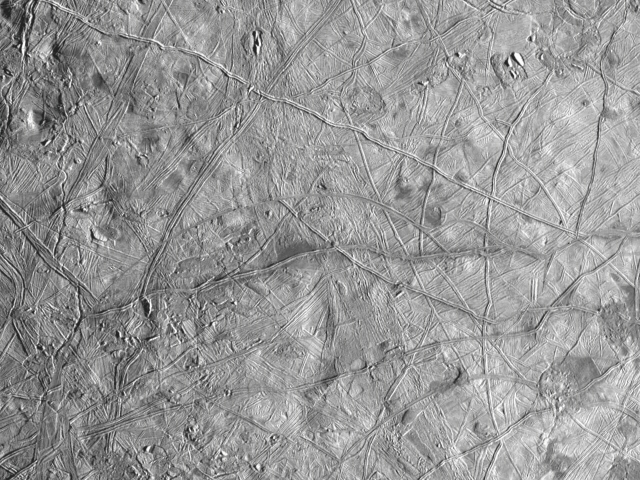 There is one significant departure from reality- Europa has been rotated from its true orientation to better show off specific surface features. 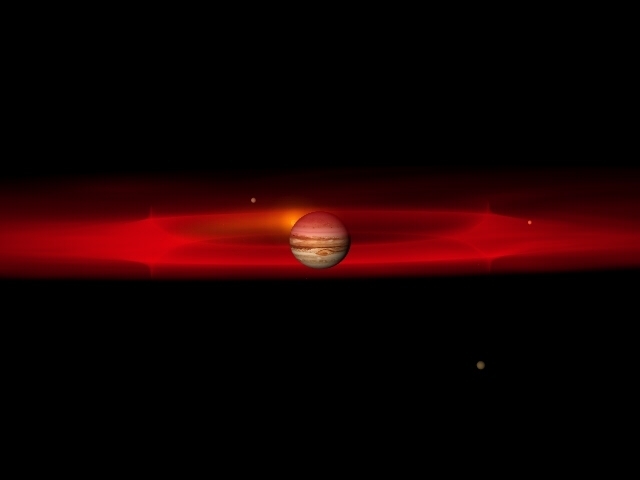 Stills (every c. 50th frame) from an Jupiter magnetosphere animation. 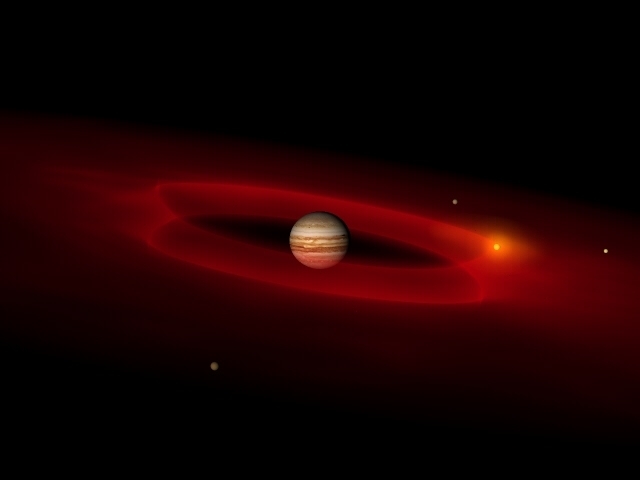 Shows Io's ionised sulfur torus (red), caught in Jupiter's rotating, tilted magnetic field and thus rotating with Jupiter. 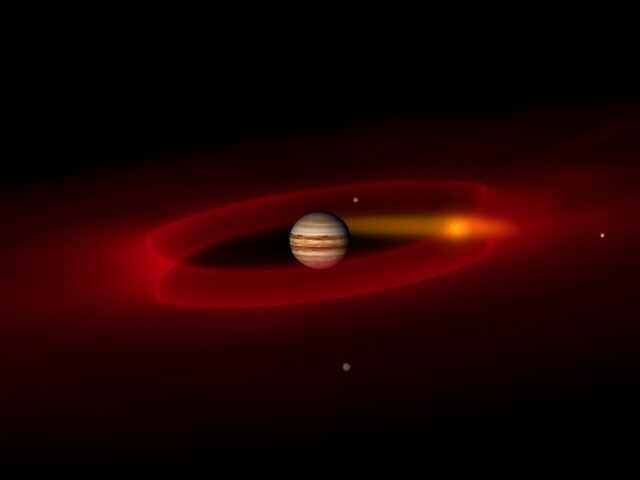 The torus really does glow red, but its brightness is here increased many, many times compared to Jupiter and the satellites to make it visible. 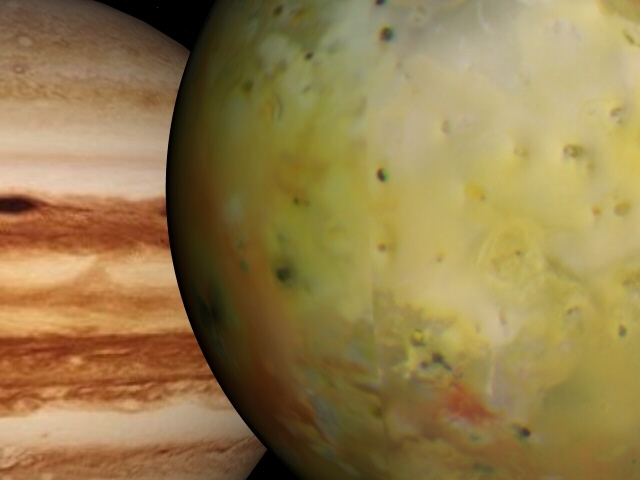 Also shows Io's sodium cloud (yellow), which is not ionised and so rotates with Io, not with Jupiter, and is centered around Io. Again the sodium cloud really glows with yellow-orange light (the same as a sodium street light), but much more faintly than shown here. Both the sulfur torus and sodium cloud are created "freehand", with some simplifications, but approximate their real appearance fairly well. 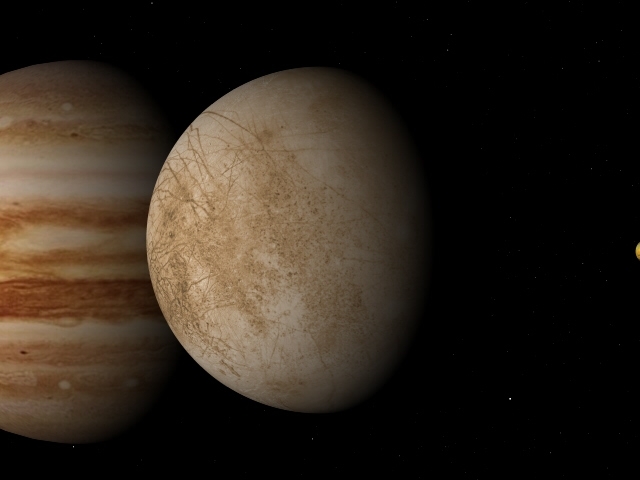 Jupiter map is from Thomas Hastings-Trew. 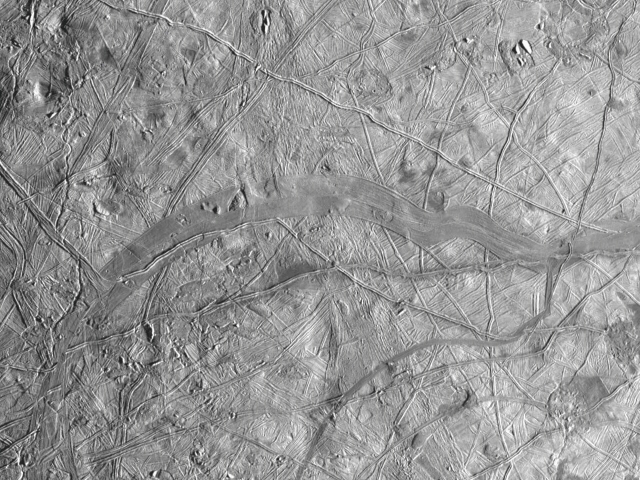 Simple animation (every c. 30th frame) of spreading of ice plates on Europa, using E11 Galileo images. 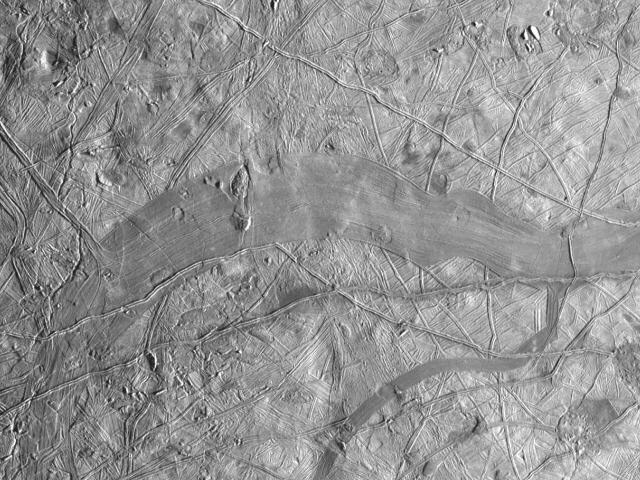 The final frame shows the surface as it appears now, and the first frame shows its presumed appearance before the fracturing and spreading, with older features lining up perfectly across the closed pull-apart band. 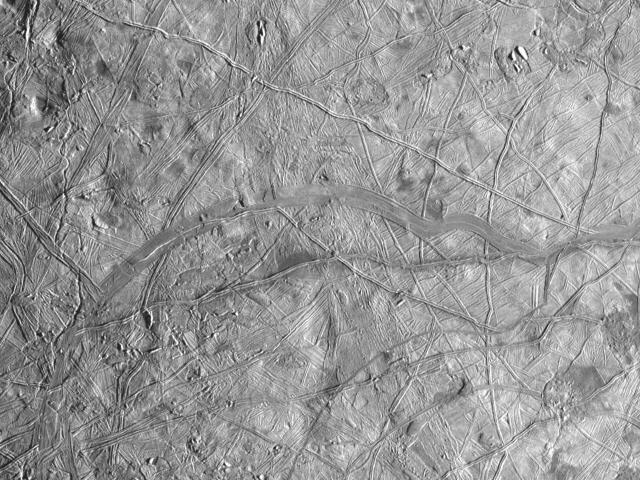 The small number of more recent features visible in the image do not behave realistically, but that can't be helped. 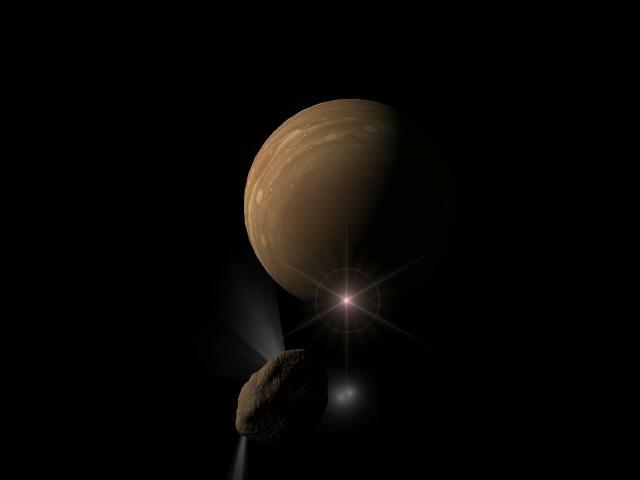 Yet another version of the Jupiter magnetosphere cartoon, done in collaboration with John Clarke of Boston University, for the Feb 28 2002 cover of Nature, illustrating the auroral footprints of the magnetic flux tubes (pink) of Io, Europa, and Ganymede on Jupiter, as seen in ultraviolet light in John Clarke's Hubble image (inset). 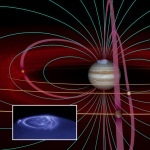 Powerful currents flow along the magnetic field lines linking Jupiter and each satellite, powered by the motion of the satellite through the magnetic field. 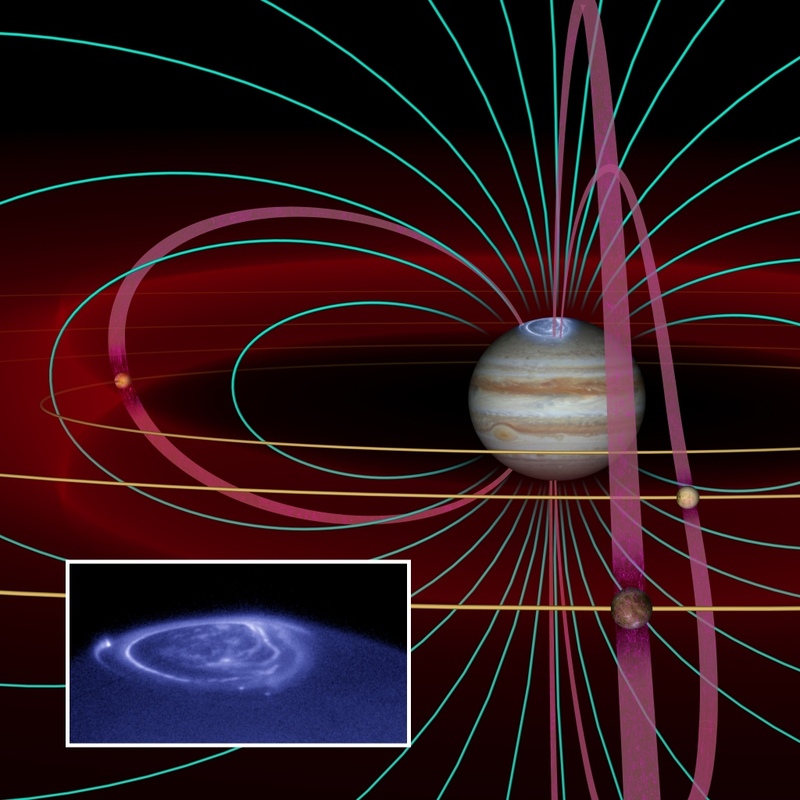 These currents make Jupiter's atmosphere glow where the magnetic field line touches the atmosphere. Higher resolution versions of the image are available on request. The Nature cover. Unfortunately Io was cropped out! 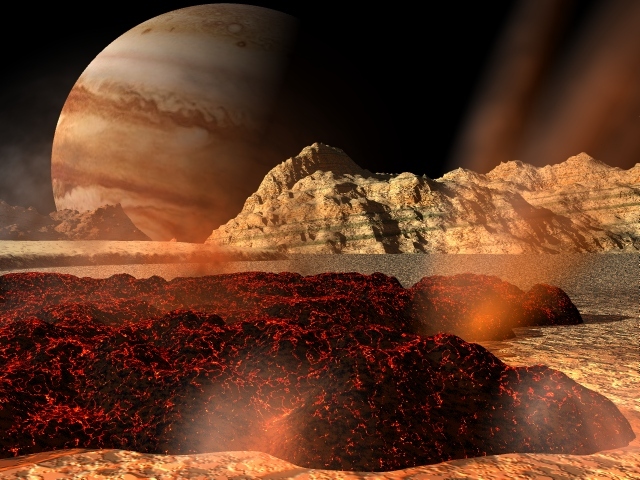 Another version of the Jupiter magnetosphere cartoon, with a close-up of Io showing volcanos and plumes, and Jupiter's aurorae based on real HST images. The sodium cloud is not shown, however. This is a high-resolution 2550 x 1275 pixel, 940K image. Like most images on this page, these were done with the Imagine 3-D rendering package, with some post-processing. 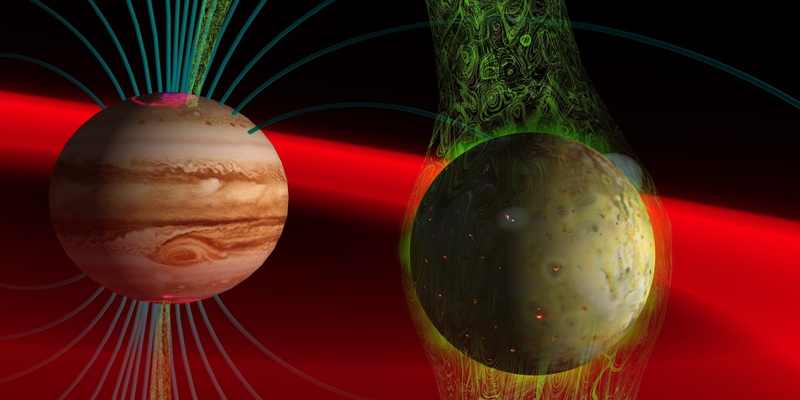 The Jovian magnetosphere, including the Io flux tube, Jovian aurorae, the sodium cloud, and sulfur torus. This image appeared on the cover of Mercury magazine, Nov/Dec 2000. It's a slightly updated version of the one custom-made for the fourth edition of The New Solar System, by Beatty, Peterson, and Chaikin. Note: 440 K in size. Publication-quality TIFF file, 5120x3840 pixels, 4.7 MB in size. 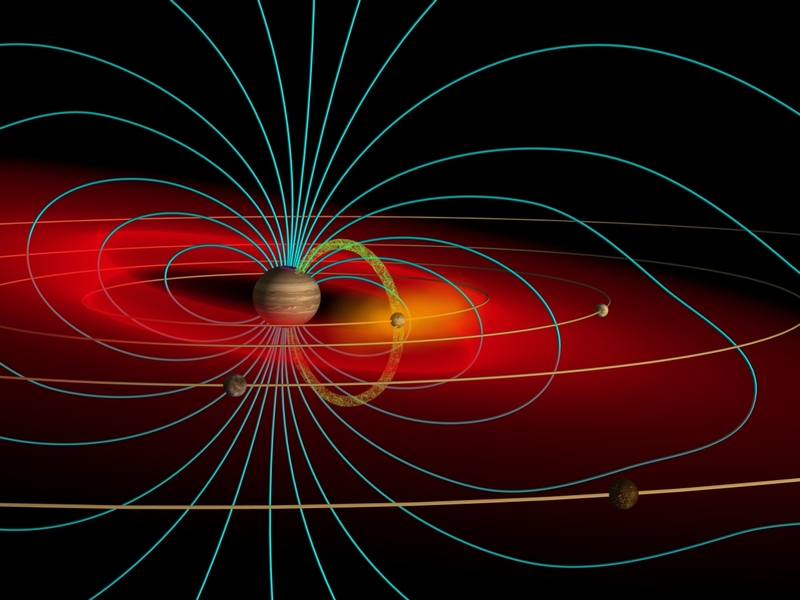 An earlier, simpler, rendition of the Jovian magnetosphere. I made this for our Great Comet Crash book, but it has since appeared in Science magazine and elsewhere. 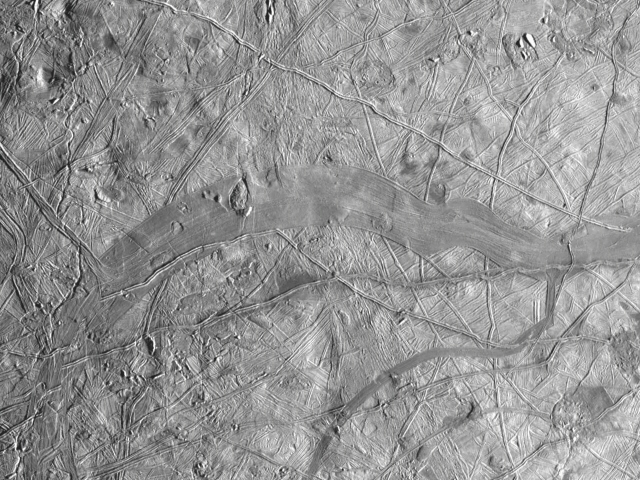 Valles Marineris, Mars (105K JPEG). Bryce 2 rendering. Not 100% realistic, but I may tweak it some more when I get a chance. The slopes are probably too steep, and the layering too pronounced. Since I wrote the above, however, Mars Global Surveyor has discovered very steep slopes, and strong layering, on Mars... I need to figure out how to make talus slopes in Bryce... I ran into one of my greatest frustrations with Bryce when making this- the inability to scale textures to sizes less than 1 or greater than 100. Bryce makes wonderful images, but not necessarily the images you want to make- lack of precise control is a real problem. 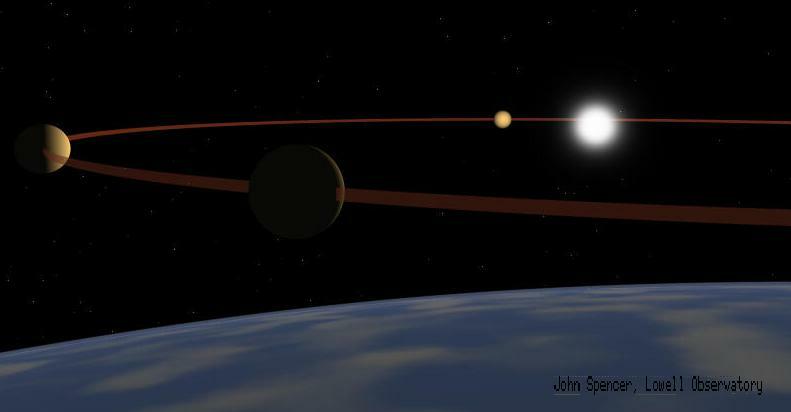 An illustration of the size and phases of Venus as viewed from Earth: an idea for a textbook illustration (16K JPEG). Imagine rendering. The G impact, had it hit Earth. Also made for our Great Comet Crash book. 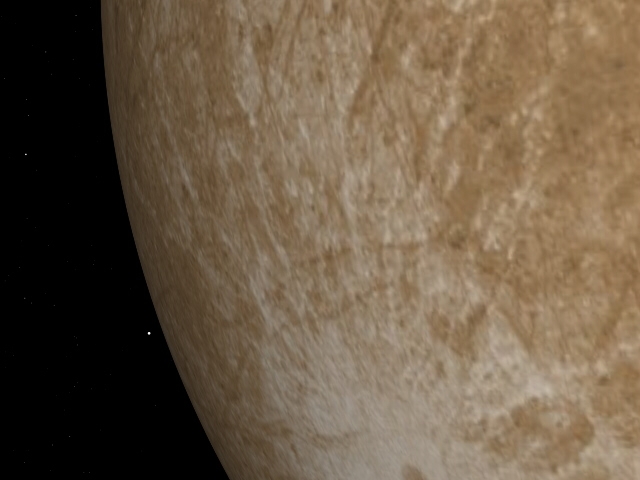 View of an SL9 fragment impact from another approaching fragment. (10K JPEG). Part of a 140-frame movie that was shown worldwide on TV before and during impact week. As it was made before the impacts, it doesn't include the black spots that were produced by the impacts, but the trajectory is accurate. Imagine rendering, postprocessing with OpalPaint. The complete animation, MPEG format, 732 Kbytes in size. Compression artifacts are noticeable in this version. 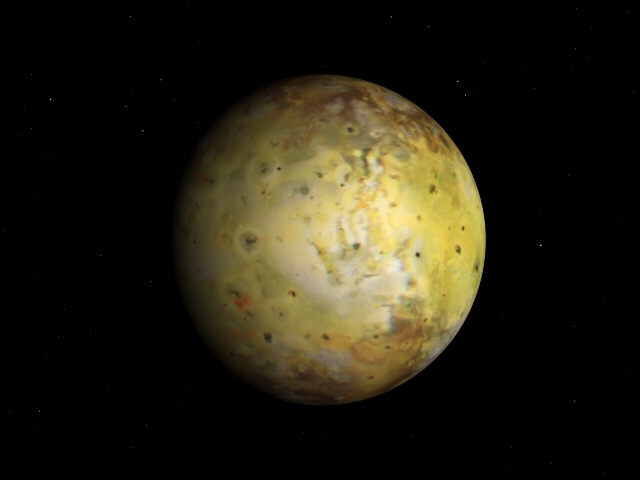 Io caldera at night, before comet impact (18K JPEG). Imagine + VistaPro rendering, postprocessing with OpalPaint. The caldera is based on a Digital Elevation Model of Manoa valley, Oahu. This and the next frame were end-members in a simple animation, which has also been widely broadcast. 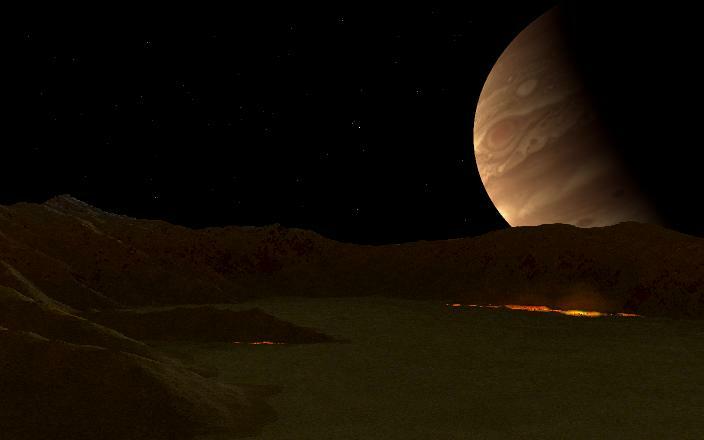 Io caldera at night, as comet impact on Jupiter lights up the landscape (25K JPEG). Imagine + VistaPro rendering, postprocessing with OpalPaint.